I do happen to like white chocolate. It’s probably down to fond memories of the milky bar kid. It’s buttery and fatty, ever so greasy with a hint of custard to it so whether this is a good or a bad thing, I am rather fond of it. So I thought making white chocolate, saffron and cardamom sorbet would be a great idea. But then, being me, I had to add some surprise flavours to it . Being a very sweet chocolate, spice came to mind to balance out the sugary flavour. That became the theme for this ice cream and it’s accompaniments. So what I have for you here is something highly aromatic and very grown up. This is all well and good but let me tell you that I have been requested by the children to “just make something normal next time”. They were not remotely interested in this flavour, nor the white chocolate, black pepper and cardamom chocolate swirls I made to go with it. Only the candied walnuts hit the right spot. I had a good time thinking and putting together flavours that I love and I was pleased (mostly) with the results. Cardamom & white chocolate work very well together as does the black pepper & white chocolate. 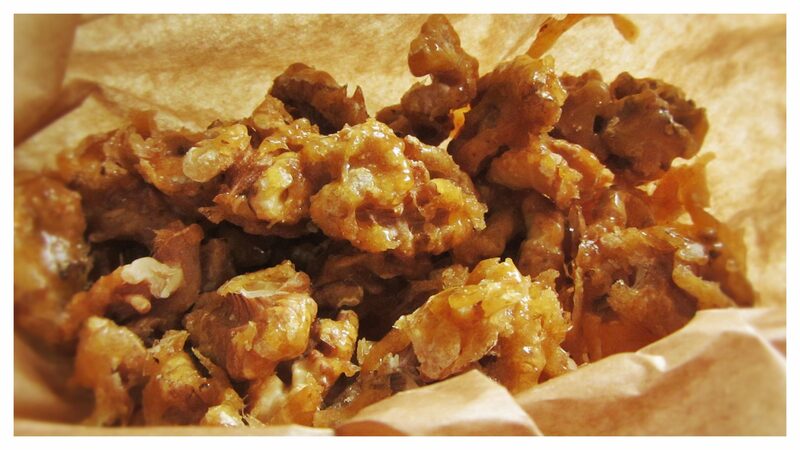 Candied walnuts made with cardamom sugar are divine. The hint of saffron gave the merest hint of yellow which was just beautiful. The recipe I followed (HERE) produced a very strange textured sorbet. I personally think it is because of the lack of sugar used in the recipe. Because of this, the sorbet would not mould into a ball very easily. It almost had a flaky, dry texture whereas my lemon sorbet scooped up into a silky ball and came out of the freezer scoopable. This sorbet was rock solid! The result and the final tasting by me with both toppings was one I was actually quite pleased with. 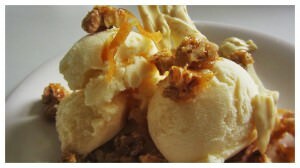 The texture of the crunchy walnuts and the crisp peppery chocolate definitely lifted the sorbet onto a higher level. Without them, I feel the sorbet fell a little flat on it’s face. 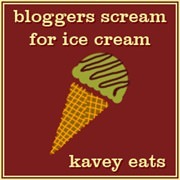 This also happens to be my entry into Kavey Eats “Bloggers Scream For Ice Cream Challenge”. The chosen ingredient is “CHOCOLATE”. 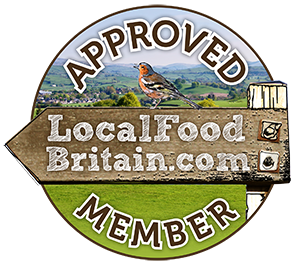 Last month’s entries can be seen HERE. I followed the recipe HERE and added the following ingredients to it. A pinch of Saffon strands. 20 Cardamom pods. This sounds like a lot but next time I would add about half the amount and take the seeds out of their pods as the flavour was too subtle I found. Pour the sugar into a small saucepan and melt the sugar over a medium heat until it begins to melt around the edges. Do not stir at this point but by the time half of the sugar has melted I began to stir it until all the sugar was melted and golden. Add in the crushed cardamom if you wish to. Pour on the walnuts and stir them in quickly to the caramel. Transfer immediately to the lined baking tray and let the mixture cool down while separating the nuts so that they don’t form one big molten lump. Melt the white chocolate in a bowl over a pan of simmering water. Add in as much black pepper as your taste requires. Add a pinch of crushed cardamom pods if you wish. 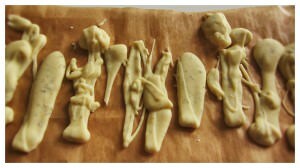 Stir the mixture and using a teaspoon drizzle rough shapes onto your lined baking tray. Leave to set either in the fridge or on a worktop but this will take longer. Scoop your ice cream and sprinkle over the candied walnuts which you can roughly chop with a knife. For dramatic artiness stand some chocolate shards against the ice cream. Think cheffy in your construction ! 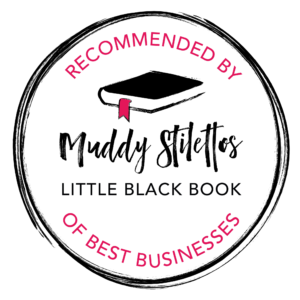 Oooh it’s so fun to read about your thought processes in developing this… the flavours sound wonderful. Hope you can resolve the texture issue next time you make it… but sounds delicious as it is! Thanks Kavey, I definitely think it is a work in progress. Has good potential! 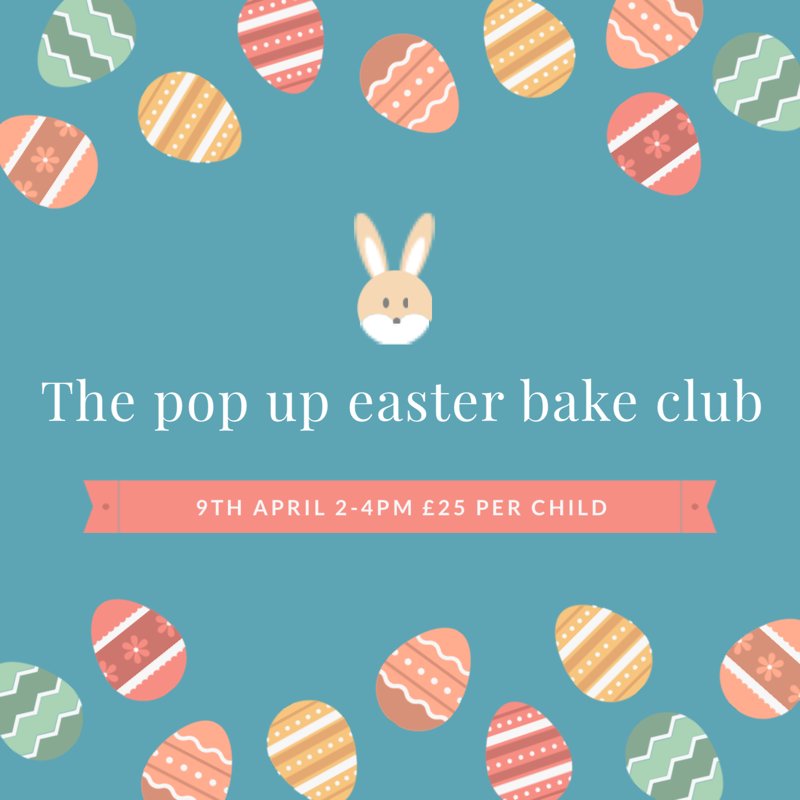 I love the sound of this and who cares if the kids don’t like it…all the more for you 🙂 The chocolate, black pepper and cardamom swirls sound lovely too, and the perfect thing to offset all that sweetness. Shame about the texture of the sorbet though, it needs to be super smooth, especially as that’s what you expect from creamy white chocolate. Yes we need the sun to get eating these sorbets and ice creams…..NOW! Well both sorbet and swirls sound divine to me Laura. Those flavours are so interesting and at least the kids enjoyed the nuts 😉 I never find scooping ice-cream easy – bought or home made! Yes you are right, it isn’t easy. But this was weirdly flaky. Although I am very fussy so that must be taken into account! Whilst I am also not a great fan of white chocolate, cardamom and black pepper are two of my favourite spices this is a must try thank you Laura. Hi James, thanks and yes why not have a go. The spices make the white chocolate taste amazing!